UF College of Education researchers found that the in-year rate of teacher attrition is substantially higher at Florida charter schools than traditional public schools. Teachers at state charter schools have more than twice the within-year attrition rate of those at traditional public schools, which could have a negative impact on student academic achievement, a new University of Florida College of Education study finds. Florida charter schools on average lost roughly 10 percent of their teachers each school year from 2011-2012 to 2014-2015, the study shows. In contrast, the teacher turnover rate at traditional public schools was about 4 percent during the same period. “We think that over the long-term high attrition rates negatively impact student learning at the charter schools,” said M. David Miller, director of the college’s Collaborative Assessment and Program Evaluation Services. CAPES is a unit of the COE that provides consulting services and collaborates with researchers across UF’s campus and outside organizations on projects with an educational component. College of Education Professor M. David Miller leads the research team. Charter school principals and administrators interviewed as part of the study cited teacher turnover as among their biggest challenges. High teacher within-year attrition – meaning during the school year – typically results in the hiring of less experienced teachers, which can negatively impede student academic achievement. Also, recruiting and hiring replacements costs valuable academic time and money. Specifically, the state’s charter schools lost 3,406 teachers between 2011-12 and 2014-2015. 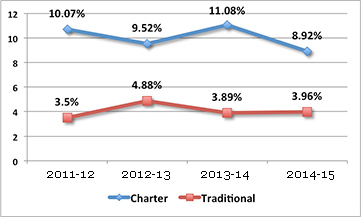 There were 9,409 teachers at charter schools in the most recent school year studied. In contrast, traditional public schools lost a total of 24,581 teachers during the same period out of the far larger pool of roughly 150,000 teachers. Salaries of teachers are almost always lower than their counterparts at traditional schools. Charter-school teachers typically do not have access to the state teacher retirement system. The vast majority of charter schools have no formal teacher mentoring programs to support new teachers. The scholars said more research is necessary to determine definitive reasons for the high attrition rates. In addition to Miller, the UF research project team includes Tom Dana, associate dean for the college; educational leadership researcher and project manager Nancy Thornqvist; and research methods graduate student Wei Xu. Miller also directs the college’s School of Human Development and Organizational Studies in Education. State education officials said the report’s findings raise concerns. “The high attrition is worrisome to me as a teacher educator,” said Chris Muire, education policy director at the Florida Department of Education. He said state education officials are reviewing the report. The scholars’ findings are included in a semi-annual report to the Florida Department of Education, which contracted with UF to assess the effect charter schools have on student achievement as part of a federal grant. This ongoing research project is the first independent look at Florida’s charter schools since the U.S. Department of Education awarded the state a five-year, $104 million grant in 2011 to support the creation of charter schools, especially in high-need neighborhoods and rural and low-income school districts. In recent years, the number of charter schools statewide has more than doubled from roughly 300 to about 700, Muire said. The UF study showed 582 in 2014-2015, up 33 percent from 436 at the start of the 2011-2012 school year. Charter schools are publicly funded and privately run schools created through agreements or “charters” with local district school boards. They are designed to increase parental options and provide schools more freedom to create innovative learning opportunities. For the evaluation, the UF researchers studied a number of variables, including: data on charter and traditional schools collected by the state, a comparison of academic achievements at comparable charter and traditional schools, and surveys of hundreds of teachers, administrators, school board members and parents. Plus, Thornqvist conducted 25 visits each year to charter schools across the state and interviewed administrators. The study comes at a time of increased scrutiny of Florida charter schools, which some observers have criticized for siphoning off precious state funds and high-demand teachers. A recent analysis by the Associated Press of Florida Department of Education records found that charter schools in 30 districts have closed after receiving as much as $70 million in state funding since 2000. The numbers in the UF study excluded teacher attrition caused by the closing of schools, whether charter or traditional, Thornqvist said. In terms of academics, UF researchers found generally only small differences in the achievement of students at a sample of comparable traditional schools vs. charter schools, though there was a slight drop in reading achievement among students at charter schools in grades 6. For this part of the study, the scholars compared the statewide reading and math assessment scores of students in grades 3-8 and in high schools at 10 charter schools and 10 comparable traditional schools, Thornqvist said. While the differences in assessment scores are small they run counter to annual Florida Department of Education reports that show students who attend charter schools generally outpace their traditional public school counterparts on state assessments. Importantly, UF researchers looked at schools with similar socioeconomic characteristics, for example ones with similar percentages of students by ethnicities and those qualifying for the federal free- and reduced-price lunch program. Previous state surveys did not account for these differences, which could affect overall results, Thornqvist said.